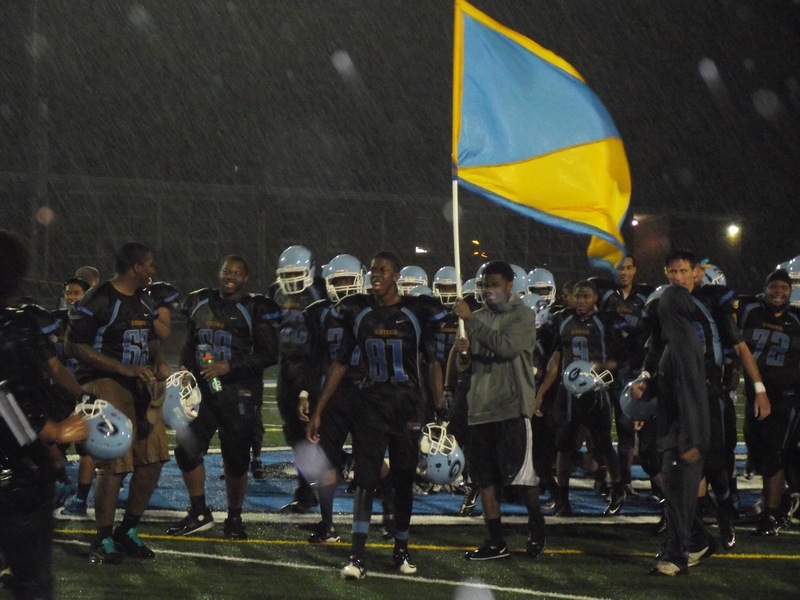 Grandview’s new synthetic field remained immaculate despite torrential downpour during last Friday’s home opener, and the Bulldogs matched the quality in a 42-14 victory over William Chrisman. Grandview overpowered the visiting Bears with over 350 yards rushing, including matching 134 yard efforts from the elite running back tandem of senior Jaavon Turner and junior Jerel Alexander. The two backs also combined for five touchdowns (3 for Turner, 2 for Alexander) in the game. A raucous home crowd and the opening of the new field added an element of exhilaration into the droplet-filled air. Grandview certainly embraced their opportunity for a fast start on Friday, as the Bulldogs jumped out to a quick 14-0 lead in the first quarter. Turner kicked off the scoring with a 40 yard touchdown, and receiver Ryone Winters followed up with 36-yard touchdown scamper on a double-reverse. Just when it looked like Grandview would dominate the rain-soaked contest, Chrisman responded with two quick scores early in the second quarter. From there, though, the Bulldogs shut down a Bear offense that repeatedly hindered itself with turnovers. William Chrisman finished the game with seven fumbles, three of which were recovered by Grandview. Grandview safety Pete Brittain recovered one of the fumbles, and also laid a series of big hits on a night where the defense didn’t give an inch after the quick-strike second quarter. Although Turner and Alexander will get the headlines, the remarkably sturdy performances from offensive linemen Apa Visinia, Akil Williams, and Josiah Quick (among others) paved the way for the home-opening victory. “This whole offensive line, they’re pancaking guys from the first quarter through the fourth quarter,” remarked Leech. Both star running backs also recognized the significant role their line played in opening up holes throughout the evening. The line dominated in blocking for the run despite only four pass attempts from senior quarterback Ryan Lee through the blustery conditions. The line will likely continue to love their jobs as long as the Bulldogs continue their winning streak. The victory over Chrisman lifts Grandview to 2-0 on the season and matches their total for victories in each of the past four seasons. Even with a quality Winnetonka team waiting in the wings next week, the offensive line remains confident that they can keep their momentum going. That level of trust and chemistry permeates through the entire Bulldog roster. That’s why Grandview doesn’t seem like a team that has recorded a losing record in every season since 2005. Even on a dark Friday evening, through three hours of pounding rain, it was clear that the ominous clouds were only temporary visitors over a team with an undeniably bright future.